Over the past three decades, research utilizing event-related potentials (ERPs) has greatly advanced knowledge concerning the neural underpinnings of a variety of cognitive processes in both children and adults. In addition, this methodology has allowed an examination of changes in the neural processes associated with cognitive development from early infancy through young adulthood. The vast majority of the ERP literature in children has been focused on investigating normative processes of cognitive development, with very few studies to date employing ERPs to examine the impact of social experience on brain development and functioning. 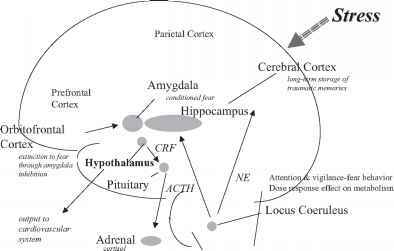 Nonetheless, the wealth of knowledge obtained from the use of ERPs concerning the neural bases of normative cognitive development can potentially inform ERP research investigating the neural correlates of the experience of child maltreatment. Reciprocally, employing ERPs to examine the neural mechanisms underlying memory processes in children who have experienced maltreatment could provide valuable knowledge concerning the effects of maltreatment on neural functioning. It may be of great importance in understanding the sequelae of maltreatment to demonstrate how ERPs may be associated with aberrations in the development and functioning of memory at the level of analysis of the brain, and in what way such aberrant neural processes may, to some degree, mediate the behavioral and developmental disturbances associated with maltreatment. Although our focus in the current chapter is on how ERPs have been utilized to examine memory in children who have experienced maltreatment, we first briefly review what is known about ERPs and memory in children who are considered to be on a typical developmental trajectory and who have not been exposed to maltreatment. This approach is consistent with one of the fundamental tenets of the discipline of developmental psychopathology—namely, that the study of normality and pathology are mutually informative (e.g., Cicchetti, 1984, 1990a, 1993; Cicchetti & Sroufe, 2000; Rutter & Sroufe, 2000; Sroufe, 1990). Cicchetti (1990a) has described developmental psychopathology as a discipline that is the product of an integration of various fields of study, including genetics, embryology, neuroscience, epidemiology, psychoanalysis, psychiatry, and psychology, the efforts of which had previously been separate and distinct. Multiple theoretical perspectives and diverse research strategies and findings have contributed to developmental psychopathology. In fact, contributions to this field have come from virtually every corner of the biological and social sciences (Cicchetti & Cohen, 2006a, 2006b, 2006c; Cicchetti & Sroufe, 2000). In addition, developmental psychopathology has made great strides in recent years to incorporate a "multiple levels of analysis" approach into its conceptual and empirical framework (Cicchetti & Blender, 2004; Cicchetti & Dawson, 2002); in part as a consequence, understanding of the development of psychopathology generally has made great advances by employing findings from basic neuroscience and normal brain development (e.g., Cicchetti & Curtis, 2006; Cicchetti & Posner, 2005; for a detailed historical review of this topic, see Cicchetti, 2002a). In particular, knowledge of normal development can and should inform the study of deviant developmental trajectories eventuating in psychopathol-ogy. This principle also is embraced by developmental neuroscientists (see, e.g., Cicchetti, 1990a, 2002a; Cicchetti & Cannon, 1999; Goldman-Rakic, 1987; Johnson, 1998). Developmental psychopathologists and developmental neuroscientists both emphasize the importance of understanding normal developmental patterns so that we may begin to investigate the ways in which deviant development may eventuate (Cicchetti & Posner, 2005).